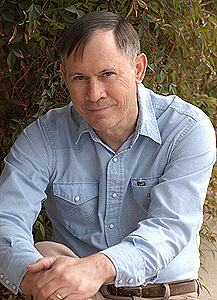 Author Patrick Dearen wears two hats. As a historian and folklorist, he digs deeply into the lore and legend of the West and produces books that appeal to both scholars and general readers. As a novelist, he draws on this reservoir of knowledge and crafts stories of people interacting with a harsh and yet beautiful land. Clay Andrews is like a dead man, adrift in an uncaring dark. But he’s also searching, and in 1869 he has ridden to the Pecos River to find answers. Back in Central Texas, Clay’s sister has died, and only on this river might he learn why. The person perhaps responsible may have fled here, but no one enters this no-man’s land except at his own peril. Comanches are on the prowl, and across the Pecos, Mescalero Apaches range all the way to the mysterious Guadalupe Mountains. Twenty-year-old Lil Casner is searching the Pecos as well—for escape from an abusive marriage. What ensues for each are Comanche attacks, a kidnapping, and a chase through Apache country to Skeleton Cave and on to the Guadalupes. For Clay and Lil, the answers will never come unless they ride into a mountain range where Indian spirits may guard a golden hoard. “A wonderful book to read if you want to learn about the life of a cowboy.” — Robert Duvall. An 1886 newspaper referred to the Pecos River of Texas and southern New Mexico as “the cowboy’s paradise.” One cowhand even reckoned that “the Pecos boys were the most expert cowboys in the world.” On the Pecos they had to be, for in frontier times it was a river so treacherous that it was known as the “graveyard of the cowman’s hopes.” This book tells the full story of the Pecos cowboy from the days of the Goodnight-Loving Trail to the 1920s. Unavailable for 20 years, this novel tells the story of a 19th century cowboy trapped in a 20th century world. Pushed and prodded by a society that has no place for him, Charlie Lyles steals a horse and saddle and rides into rugged canyon land in search of the lost Old West. His action sparks a manhunt that pits the wits of an old-time cowboy against the technology of the modern world. Inspired by an actual manhunt, this is a novel about dreams that should never die. “An instant classic that deserves a place on anyone’s list of Best Western Novels.” – Roundup Magazine of Western Writers of America. The first environmental history of the Pecos, Bitter Waters tells the story of man's progressive impact on this iconic river that flows 926 miles from northern New Mexico to the Rio Grande on the Texas-Mexico border. Spanning 430 years of history, Bitter Waters also examines the stream's current issues, including low flow, salinity, saltcedar, golden algae, endangered species, and water conflicts between Texas and New Mexico. For each of these, Bitter Waters offers potential solutions that might save the river for future generations. "A thought-provoking study. To all who realize that water will be more precious than gold, this is a must-read." Ray Willis, Pecos River Commission. 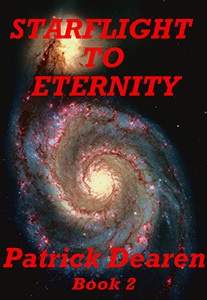 Available in print and ebook..
A story that could have come out of today's headlines, this revised ebook of Patrick Dearen's 1981 novel explores an illegal alien's desperate attempt to provide for his family. Ricardo has known only poverty in Mexico, but he dreams of a better life in the United States. He enlists a "coyote" to smuggle him across the Rio Grande, a river that separates not only one nation from another, but one world from another. The Illegal Man is also the story of Ann Rawlings, a recent widow struggling to preserve her West Texas ranch. There is also her bigoted foreman, who considers his Mexican national ranch hands to be little more than animals. For Ricardo, it's a world in which he will suffer hardship and indignity, but one he will gladly endure to support his family. "A vivid description of what a common man goes through seeking work in a different country than his own. It is a powerful story, filled with adventure, sadness, persecution, and loneliness." -- San Angelo (Texas) Standard-Times. Available in all ebook formats. 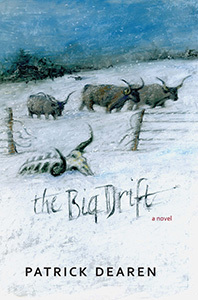 For two men, the great cattle drift and roundup of 1884-1885 will be a search for redemption. Trapped under his horse in a blizzard, Texas cowhand Will Brite finds an unwelcome savior as former slave Zeke Boles emerges from the blinding snow and a bloody past. This fugitive stirs haunting memories, but little does Will know that their lives will be inexorably linked throughout the most brutal roundup of the nineteenth century. Ebook formats available at major online booksellers. 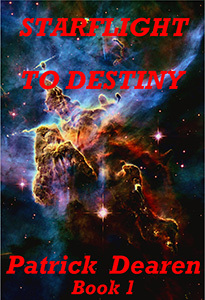 In this sequel to Starflight to Destiny, a wizened old man has returned from deep space, bearing a strange tale of the planet Faroul. This legendary world is said to be a place where time began and ends, and where a man may gain the power to create. But Faroul is much more, for it holds the fate of the cosmos. It's up to a starship deserter and a prostitute with a mysterious past to embark on a quest to find Faroul and unravel its mysteries. Ebook. Hidden in the reaches of the galaxy, a great power holds the fate of the cosmos. A man and a woman each learn half the clues to its secrets, and together they defy a totalitarian government and embark on an interstellar quest with pirates to find it and save creation. Ebook. Three men haunted by the past . . . A girl haunted by the present . . . And all four on a collision course for Horsehead Crossing on the Pecos, a Texas river synonymous with hell. This chase novel, set in 1886 along the driest stretch of any trail in the West, takes the reader deep inside troubled characters whose fates await on the Pecos. Patrick Dearen traces the 400-year history of this notorious Texas river from the time of the first Spanish explorers to the coming of the railroad and dawn of the 20th century. Meticulously documented for historians, it is also colorfully written for those with little or no background in early western history. It’s 1932, the depths of the Great Depression, and thousands of desperate people ride the rails in search of jobs, homes, and hope. For some, the track is a road to nowhere, a dead end in a boxcar or under the wheels or in a sea of emptiness. Their fate seems certain until Ish Watson grabs the rungs of a passing freight train bound for a dying relative on the Texas Gulf Coast. Lost gold . . . buried treasure . . . jack-loads of silver . . . The stories quicken the pulse of any reader. In this brief book, Patrick Dearen explores the facts and folklore behind ten legendary Texas treasures. You may not have heard of these bonanzas, but you’re unlikely to forget them after reading Lone Star Lost. Every time a cowhand dug his boot into the stirrup, he knew that this ride could carry him to trail’s end. In real stories told by genuine cowboys, this book captures the everyday perils of the working cowhand. Drawn from the author’s interviews with 76 men who cowboyed in the West before 1932, as well from 150 archival interviews with 19th century cowhands, this book will entrall as well as inform. Working cowboys live on as genuine legends who rode through a golden moment in American history. In the 1980s historian and author Patrick Dearen went looking for the last of these fading icons and found 76 men “who would do to ride the river with.” Their stories of weather folklore, humor, and stampedes bear the unmistakable brand of an Old West that is now but a dusty grave on a long-lost trail. Fourteen-year-old Josh and his friend Shan are facing hard times on their families’ farms in Central Texas in 1934. It’s the days of the Dust Bowl and Great Depression, and rain is as scarce as money. With the long dry spell have come wild animals with flashing teeth and deadly rabies. Dust storms known as black blizzards are raging, threatening lives and destroying crop land. From rabid animal attacks to a deadly flood to a barreling freight train, Josh is in for an adventure he will never forget. It’s 1867, and 11-year-old Fish Rawlings and his cousin are headed across Texas on a wagon train. But the trail is full of danger. A Comanche war party is on the prowl, looking for horses and scalps. Among the Indians is 11-year-old Hunting Bear, who is riding his first war trail. He has been taught to hate white men, while Fish has been taught to hate Comanches. But all of that changes when the boys become friends and must find a way to prevent their peoples from fighting. Eleven-year-old Fish Rawlings has always wanted to be a cowboy. Now, in the spring of 1868, he has his chance. His uncle is driving a cattle herd across Texas, and Fish is going with him as far as Horsehead Crossing on the Pecos River. Little does Fish know that he is saddling up for the wildest ride of his life. It’s the roughest stretch of trail in Texas, and it will either make a cowhand out of a boy or break him. The Big Bend of Texas is a mysterious place in 1869. Legend has it that there’s a lost gold mine in the Chisos Mountains. But when 12-year-old Fish Rawlings and his cousin Gid discover a dying Indian in the desert, they have reason to believe it’s more than legend. Suddenly the boys find themselves with a great secret. No one else knows the way to the lost Chisos mine, but the journey won’t be easy, even with the help of an Apache boy. And what will they do if they succeed? Cowman Mayer Halff rode a long, busy trail that few men could have followed. It carried him from 1850s France to Texas and across 1,500 miles of wild western country waiting to be tamed. Throughout, he was at ease whether dining with a U.S. president at a plush metropolitan banquet or squatting across a campfire from a dirt-streaked cowboy in a forsaken cow camp. Patrick Dearen carefully weaves Halff’s story against the backdrop of the Texas cattle industry. The droughts, the drives, the drifts, the die-ups – they bolt through these pages like stampeding cattle. In frontier times, the Pecos River of Texas was more moat than river, a deadly barrier of quicksand, treacherous currents, and impossibly steep banks. Only at its crossings could travelers hope to gain passage. Even if the Pecos proved obliging, Indian raiders and outlaws often did not. Patrick Dearen draws upon years of research and relates the history and folklore of all of the river’s Texas crossings: Horsehead, Pontoon, Pope’s, Emigrant, Salt, Spanish Dam, Adobe, S, and Lancaster. 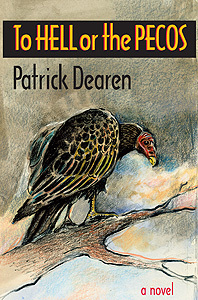 Patrick Dearen spent years studying the legends and mysteries of the harshly beautiful Pecos River country of Texas. 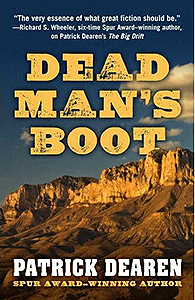 This book could be considered a definitive study of six topics – Castle Gap, a landmark on the Goodnight-Loving, Butterfield, and Comanche War trails; Horsehead Crossing on the Pecos, the most infamous ford of the Old West; Juan Cordona Lake, a source of salt for millennia; a ghost that is said to wander the Fort Stockton night; the Lost Wagon Train, a 40-wagon caravan buried in the West Texas sands; and the Lost Sublett Mine, said to contain a fortune in gold. Rich in history and folklore, the Pecos River country of West Texas has shaped the lives of those who live there. Patrick Dearen spent years tracking down its stories and then painting word portraits of some of its intriguing individuals, forgotten sites, and legends. “Using the drama and color of a gifted storyteller – like a contemporary J. Frank Dobie – Patrick Dearen in these pages lets us sample the many flavors of his Pecos frontier.” – Elmer Kelton in the foreword. 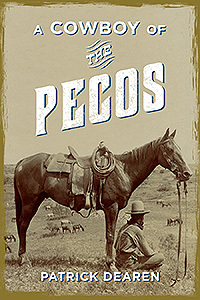 Scripted by Patrick Dearen, this one-hour DVD is a history of the Pecos River of Texas. Dearen and co-host Mike Cox, under the direction of filmmaker Glen Sample Ely, take viewers to many of the river’s historic sites. “A splendid introduction to a vital part of the Western Texas heritage.” – Elmer Kelton, seven-time Spur Award winner.